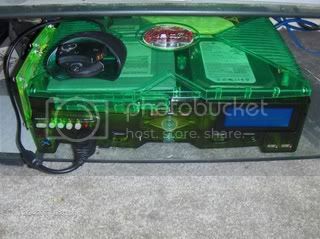 In my box I got a Fan put onto my heatsink then I put other fan right behind my dvd drive. With thos 2 fans plus my upgraded 80 fan in all runing at 12v it decreased the temp by 20 degrees Ill put some pictures on here of my box in a little bit. Cant wait man post them pics so i can get my cool air fix for the day. Yeah really man. Thats awesome. Post some pics as soon as you can. Alcohol free beer is like licking your sister... tastes the same but you know deep down it's just wrong!!!! 1. The increased noise 4 externally mounted fans would make. 3. How to power all the fans without making major changes to the box's power supply. Does anyone have an example of such a box, I'd love to hear from you, post pics etc. I got pics all over the place of mine running 2 80mm fans on the left hand side but i have not seen any running 4, i wold say it wold make a good bit of noise. Its more the styling of the thing that worries me. I'm a big stickler for aesthetics and I'd want the box to look good. Would be ideal if anyone has a pic of a box running 4 fans, 2 either side so I can have a look. Can I have a look more at the fans on the side if poss, trying to get an idea of what it would look like. Sure thing man, this pic was in my photobucket so if you want a more head on shot let me know but this one gives you the ugly angle so you can see it at its worst. I supposae its not too bad really. The side of my case is still black, so the fans should match colour wise without any probs. I dont think it looks bad at all and with yours being black stock 80mm case fans wold work and be a nice cheap way to keep it cool. As long as it doesn't clash too much with the skin and I can find some way to power them all, I may well go for it. sorry to jump into a topic and dont want to start one just for a question but anyway i got a 12V fan in my box and i was told that if i cut the black cable and wire it to a screw on the mobo is this true? Ifind it best to wire the black wire from the fan to the black wire going to your hdd. does that speed it up s oit will run as a 12V suppose to run cuz i dont think it is pushing what it can push but my box is fine doesnt overheat or nothing i just want the best of the fan you know?